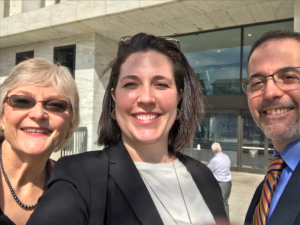 Last week, WSALPHO attended the National Association of City and County Health Officials (NACCHO) annual Public Health on the Hill in Washington DC. As the state affiliate for Washington, WSALPHO has an important role in communicating the importance of local public health and the need for stable funding at the federal level to support local programs. Left to right: Patty Hayes from Public Health Seattle and King County, Jaime Bodden – WSALPHO Managing Director and Andre Fresco from Yakima Health District in Washington DC. Policies that support infrastructure and local health department capacity to participate in health data systems to connect prevention work with health care and human service providers. In Washington State, this enables local health participation in Medicaid Transformation work and facilitate community initiatives such as suicide prevention programs, homelessness, and responding to the opioid crisis. FY 2020 appropriations to fund Centers for Disease Control and Prevention infectious disease prevention and control, Immunization Program, and zoonotic and vector-borne diseases. In Washington State, we are seeing increasing rates of Hepatitis C, STDs, and healthcare-acquired infections. We’re also experiencing the largest measles outbreak in recent state history, with over 71 cases confirmed—mostly in children under 10 years. This past summer, western Washington had its first ever confirmed case of West Nile Virus in humans. Local health has the responsibility of responding to each of these communicable disease threats through outbreak response, surveillance, and control efforts. Establishment of a Public Health Emergency Fund and the passage and implementation of the Pandemic and All-Hazards Preparedness and Advancing Innovation Act. These programs will allow local health to immediately access emergency funding when public health disasters or outbreaks occur and will assist local health in building capacity in local readiness and response. This support is absolutely critical when a crisis hits. For example, the measles outbreak has already surpassed $1.5 million dollars in cost. Both state and local response has included over 10,000 staff hours. Fiscal Year 2020 appropriations to support the Maternal and Child Block Grant, and Maternal, Infant, and Early Childhood Home Visiting programs. Local health implement programs such as the Nurse-Family Partnership which improves family connectedness strengthens resiliency and decreases child abuse and neglect. Washington State also has some of the highest rates of maternal mortality in the country. Local health works to improve birth outcomes for both baby and mother.